1And Samson went down to Timnath, and saw a woman in Timnath of the daughters of the Philistines.2And he came up, and told his father and his mother, and said, I have seen a woman in Timnath of the daughters of the Philistines: now therefore get her for me to wife.3Then his father and his mother said unto him, Is there never a woman among the daughters of thy brethren, or among all my people, that thou goest to take a wife of the uncircumcised Philistines? And Samson said unto his father, Get her for me; for she pleaseth me well.4But his father and his mother knew not that it was of the LORD, that he sought an occasion against the Philistines: for at that time the Philistines had dominion over Israel.5Then went Samson down, and his father and his mother, to Timnath, and came to the vineyards of Timnath: and, behold, a young lion roared against him.6And the spirit of the LORD came mightily upon him, and he rent him as he would have rent a kid, and he had nothing in his hand: but he told not his father or his mother what he had done.7And he went down, and talked with the woman; and she pleased Samson well.8And after a time he returned to take her, and he turned aside to see the carcase of the lion: and, behold, there was a swarm of bees and honey in the carcase of the lion.9And he took thereof in his hands, and went on eating, and came to his father and mother, and he gave them, and they did eat: but he told not them that he had taken the honey out of the carcase of the lion.10So his father went down unto the woman: and Samson made there a feast; for so used the young men to do.11And it came to pass, when they saw him, that they brought thirty companions to be with him.12And Samson said unto them, I will now put forth a riddle unto you: if ye can certainly declare it me within the seven days of the feast, and find it out, then I will give you thirty sheets and thirty change of garments:13But if ye cannot declare it me, then shall ye give me thirty sheets and thirty change of garments. And they said unto him, Put forth thy riddle, that we may hear it.14And he said unto them, Out of the eater came forth meat, and out of the strong came forth sweetness. And they could not in three days expound the riddle.15And it came to pass on the seventh day, that they said unto Samson's wife, Entice thy husband, that he may declare unto us the riddle, lest we burn thee and thy father's house with fire: have ye called us to take that we have? is it not so?16And Samson's wife wept before him, and said, Thou dost but hate me, and lovest me not: thou hast put forth a riddle unto the children of my people, and hast not told it me. And he said unto her, Behold, I have not told it my father nor my mother, and shall I tell it thee?17And she wept before him the seven days, while their feast lasted: and it came to pass on the seventh day, that he told her, because she lay sore upon him: and she told the riddle to the children of her people.18And the men of the city said unto him on the seventh day before the sun went down, What is sweeter than honey? and what is stronger than a lion? And he said unto them, If ye had not plowed with my heifer, ye had not found out my riddle.19And the spirit of the LORD came upon him, and he went down to Ashkelon, and slew thirty men of them, and took their spoil, and gave change of garments unto them which expounded the riddle. And his anger was kindled, and he went up to his father's house.20But Samson's wife was given to his companion, whom he had used as his friend. 12Then spake Jesus again unto them, saying, I am the light of the world: he that followeth me shall not walk in darkness, but shall have the light of life.13The Pharisees therefore said unto him, Thou bearest record of thyself; thy record is not true.14Jesus answered and said unto them, Though I bear record of myself, yet my record is true: for I know whence I came, and whither I go; but ye cannot tell whence I come, and whither I go.15Ye judge after the flesh; I judge no man.16And yet if I judge, my judgment is true: for I am not alone, but I and the Father that sent me.17It is also written in your law, that the testimony of two men is true.18I am one that bear witness of myself, and the Father that sent me beareth witness of me.19Then said they unto him, Where is thy Father? Jesus answered, Ye neither know me, nor my Father: if ye had known me, ye should have known my Father also.20These words spake Jesus in the treasury, as he taught in the temple: and no man laid hands on him; for his hour was not yet come.21Then said Jesus again unto them, I go my way, and ye shall seek me, and shall die in your sins: whither I go, ye cannot come.22Then said the Jews, Will he kill himself? because he saith, Whither I go, ye cannot come.23And he said unto them, Ye are from beneath; I am from above: ye are of this world; I am not of this world.24I said therefore unto you, that ye shall die in your sins: for if ye believe not that I am he, ye shall die in your sins.25Then said they unto him, Who art thou? And Jesus saith unto them, Even the same that I said unto you from the beginning.26I have many things to say and to judge of you: but he that sent me is true; and I speak to the world those things which I have heard of him.27They understood not that he spake to them of the Father.28Then said Jesus unto them, When ye have lifted up the Son of man, then shall ye know that I am he, and that I do nothing of myself; but as my Father hath taught me, I speak these things.29And he that sent me is with me: the Father hath not left me alone; for I do always those things that please him.30As he spake these words, many believed on him. 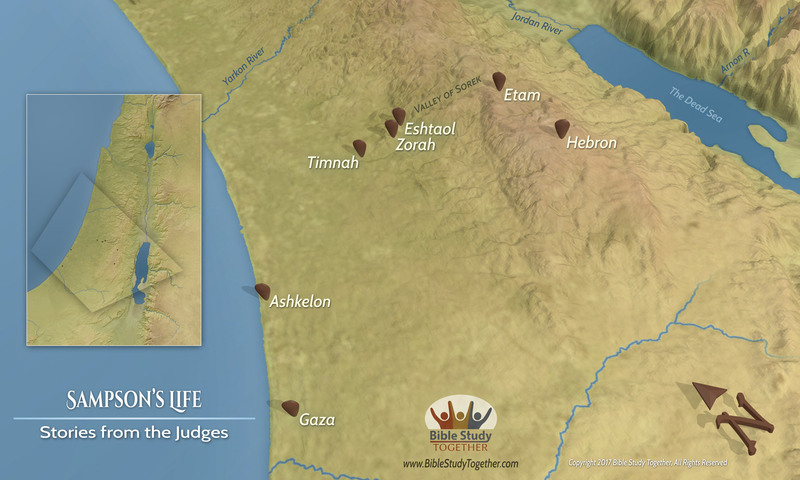 How did Samson disregard the law given to the Israelites? How did God use Samson’s sinful desires and choices to accomplish His purposes? How did Jesus make choices and form His perception of the world? How can you follow Jesus example? Bear witness of who Jesus is to someone.